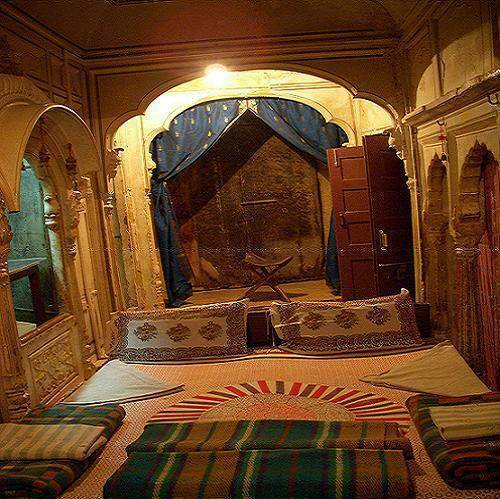 If you want to stay like Maharaja in a authentic 500 yers old. Stay with Noble bramin Family. Larage spacacious rooms With all private bath and hot cold shower. WE ALSO PROVIDE :- (Extra Charge) Laundry , Car rental for all over India (a. c. or non a. c.) , Motor bike and Cycle Rental for Jaisalmer only , News Paper , Money Change , Docotor on Call , train/bus/air reservation , Camel / Jeep Safari minimum of 4 hours to maximum of 21 days including Deset Food / music / Dance eith camp fire. EtC. There is a shop in the Hotel selling :- Internet , C. d. burning from d. Camera , Choclate , Bisciut , Chips , Juice , Cigaretes , std / isd / pco, Fax , and all other items of daily need of tourist. 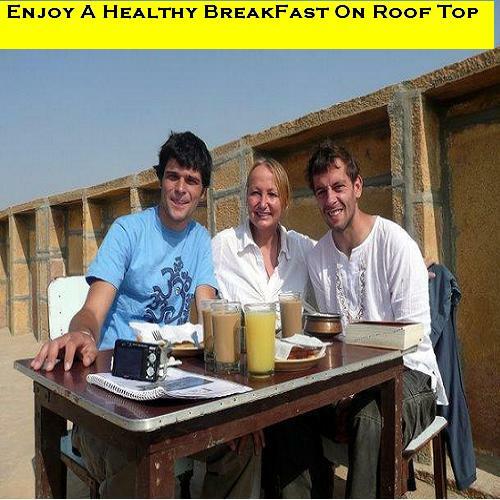 ROOF TOP RESTAURANT :- There is a in house rstaurant in the Haveli Which provides breakfast , lunch , snacks , dinner either on roof or also in room. Tea , Coffee , Cold Drinks , Minral Water Is possible 24 Hours. It is the best place to enjoy Masala Tea on terrace at the time of Sunset. We also provide especial candle light Dinner on the Roof . We are quit famous for our RAJASTHANI THALI (VEGETARIAN). We provide total heartly satisfacton to the tourist. And that is all we are known for from last 18 years in this tourism industry. Offers stuuning view from rooms and Roof Some rooms with blconies. LOCATION OF HOTEL :- HOTEL SURAJ is situated on the corner of the fort wall so it provide magnificient view of the Old City. 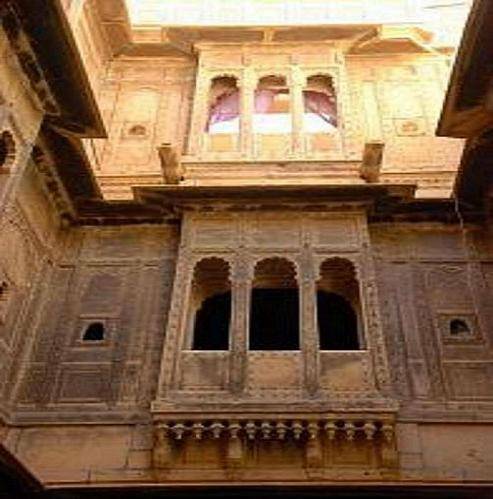 As well as it is the second highest location of the Jaisalmer Fort so the terrace provides breath taking view of the Fort Houses, Lake, Sunrise, Sunset, Jain Temple, and many more Historical Places of Jaisalmer Town. You can enjoy the 360 Degree panoramic View of the GOLDEN CITY. Payment at time of departure. No canclelation charge if cancelled 24 hours before. 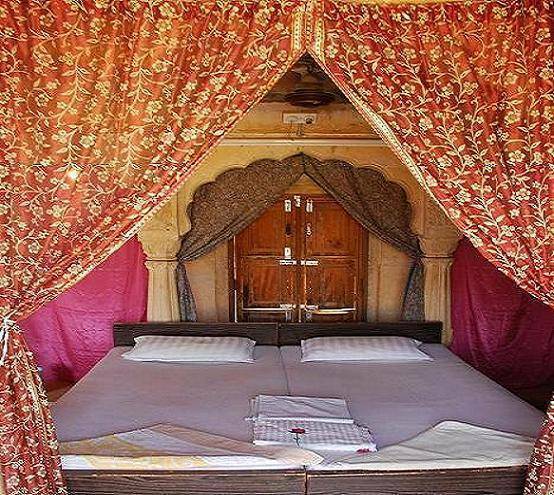 Situated in the golden fort of JAisalmer as it on the edge of the fort so offers great view of sunset and desert and lake. Just next to World Famous Jain Temples and within walking distance to all touristic points of the town. Free fick up from train or bus stands.